Let’s be real – we love our kids and pets, but both can be very tough on carpet! Children tend to spill drinks and food and track in dirt. Pets often leave behind urine spots and also track in dirt. But pets can be especially hard on carpets because of their claws. Over the years, you may notice the edges and corners of your carpets start to fray because your cats use your carpets as a nail sharpener. 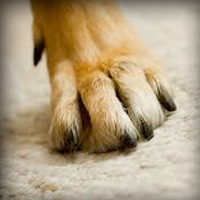 Or your nervous dog may “dig” into your carpet and leave small (or big) holes and ripples and bumps. When you have damaged carpet, you have one of two options. You can either replace the carpet, or you can check into having it repaired. Often, you don’t need to replace your entire carpet if only a piece or part of it has been damaged by small burns, pets, berber snags and runs, bleach stains and ripples and bumps. Here are the ways that carpets can be repaired. If your carpet has a hole or has a stain that just can’t be removed, then the best option may be to patch the carpet. You do need to have some spare carpet available (such as leftover carpet from the installation, or a square from a closet). Only a matching carpet piece will work with a carpet patch. Another common issue with carpets, especially when you have pets, is frayed edges along seams. Re-seaming the edges is usually possible and can look really great if done by a professional. When your carpet starts getting bumps, it’s not only unsightly but it can also be dangerous if someone trips over the bump. Fortunately, carpet repair professionals can re-stretch most carpets and make them look freshly installed. If you like the look of your carpet and don’t want to replace it, check with a professional first about having it repaired. We’d be happy to discuss this service with you if you live in the Chicago North Shore or Northwest Suburbs!